Skipping has long been associated with school playgrounds and for many years if you saw an adult skipping, the chances were that they were training for boxing. Over recent years, however, people have come to understand just how fit boxers have to be and as a result of this, skipping has gained a whole new level of respect amongst the fitness community. If you’ve already decided that skipping is for you then you might want to skip on down to later sections in this article, where we explain the key features of a good skipping rope, suggest our top ten picks and then give a round up of the best skipping ropes in the UK for different situations. If you’re interested in skipping but still not quite sure it’s for you, then please carry on reading. Although skipping is, first and foremost, cardio, even regular skipping will also give your arms and legs a workout, especially if you use a skipping rope with weighted handles. If you want to take it up a gear, there are plenty of “jump rope workouts” available and they range from beginner-level to pro-standard. Skipping is classed as a high-impact exercise, but what that means in practice basically depends a lot on how you go about it. Above all, it depends on the level of cushioning beneath you. Because of this, it can be a good idea to look for softer surfaces on which to skip, for example grass instead of tarmac or carpet instead of had flooring. You might also want to invest in a good pair of trainers. If you want to skip in an upstairs room or flat then skipping on a soft surface will help to please both your joints and your neighbours. If you only have hard floors, consider investing in a thick yoga mat. Practising good skipping technique will also help keep the noise down (and your joints in good shape). The key point of good skipping technique is to keep the weight on your toes rather than trying to jump flat-footed. You want your knees to be just slightly bent (almost straight but not locked) and the idea is just to skim over the rope with each jump. Avoid great leaps and/or deep landings unless you’re doing an advanced workout which specifically requires them. When you first start to skip, it’s generally best to keep the handles of your skipping rope roughly level with your waist. As you improve, you can raise them up your ribcage, but you probably want to stop at the top of the ribcage/bust area, again unless you are doing an advanced workout which specifically requires this. Skipping is probably the most economical form of exercise there is not just in terms of value-for-money, but also in terms of value-for-space, which is probably almost as important these days. Even the most premium skipping rope in our selection is a fraction of the price of just about any other item of gym equipment and what’s more they can be used indoors or outdoors, by yourself or in a group. You can even take your skipping rope with you when travelling, not only will it go in carry on you could pop it into a handbag or even a decent-sized pocket. If you’re planning on skipping regularly as part of a fitness routine, then you’re going to need something better than the length of old clothes line you may have used as a child. The good news is that even premium skipping ropes are really affordable. If you’re wondering what differentiates a premium skipping rope from a budget one, then here are the five, main points to consider. A child-size skipping rope may not be long enough for a grown adult whereas many (but not all) skipping ropes with longer ropes can be made shorter. Even when they can’t, you have the option of knotting it or wrapping the excess round your hands. It may not be elegant but it can get the job done. By contrast, if you want to skip in a confined space, you may want to look for a cordless skipping rope. This may seem like a contradiction in terms, but they do exist and can be perfectly effective. They are also a good choice for people who lack confidence in their coordination. Some skipping ropes have weighted handles to increase the intensity of your workout. The weights involved might seem miniscule (objectively, that’s exactly what they are), but you’ll feel the difference. In terms of skipping, flexibility really means spinnability. One of the big differences between children’s skipping ropes and proper fitness skipping ropes is that the latter are designed to support much faster, more powerful spins. In fact the quality of the spinning mechanism is a key factor in determining the quality of a skipping rope. The basic wooden or plastic handles of children’s skipping ropes just won’t cut it if you’re working up a serious sweat. You want handles which really feel good to hold and which ideally have some means of either absorbing or draining away your sweat. Skipping ropes spin a lot and regularly hit the ground. They need to be strong enough to deal with this. Also you want them to remain tangle-free both in use and in storage. This “rope” is actually steel wire with a plastic coating plus an additional protector you can put on (if you wish) when using the rope on hard surfaces. You also get a handy carry case. It has a maximum length of 2.8M but is adjustable so if you’re shorter you won’t feel overwhelmed. Beast Gear has developed a very effective ball-bearing mechanism which will satisfy anyone’s need for speed and it has 360 degree handles for maximum flexibility. 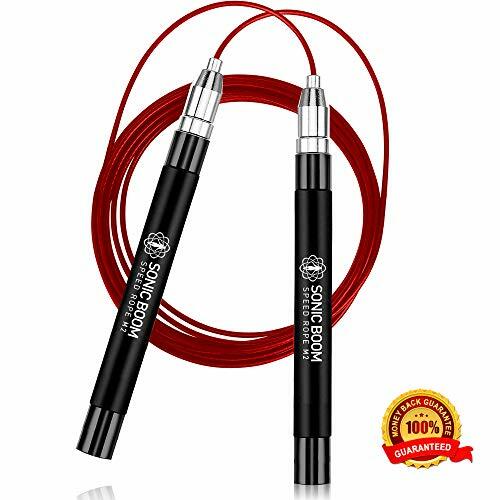 This skipping rope is made from premium materials and designed to stand up to long-term use by serious fitness enthusiasts. If you’re not ready to jump in at the deep end with skipping, then the CIVAH skipping rope offers a budget-friendly way to test the waters, while still providing a decent level of performance. This “rope” is also steel wire with a PU coating and when it arrives it is 3M long, but this is adjustable. 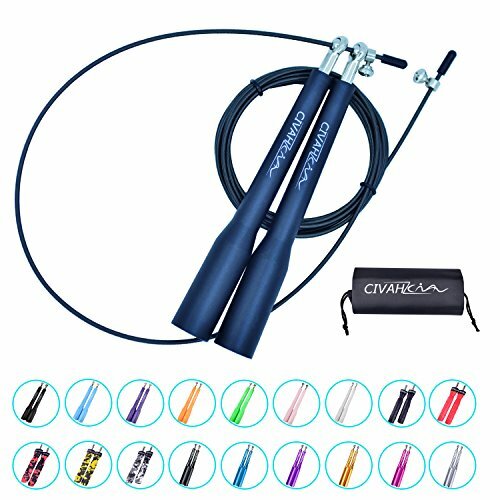 The CIVAH skipping rope offers three different types of handles, namely 18mm metal grip, 21mm PP grip and 25mm PP grip and at this price, you could try out different ones to see which suits you best. You also get a great range of colours and even some patterns. 100% MONEY BACK GUARANTEE----If you are not satisfied with our products,contact us and have a 100% refund at any time. Designed specifically for CrossFit the Epitomie Fitness Sonic Boom Mach2 comprises a stainless-steel “rope” with a polymer coating, fitted into silicon-grip handles via a patent-pending, self-locking fitting and a 360-degree spin ball bearing system. In fact, you actually get two ropes of 10 feet (about 3 metres) each. Naturally you can adjust the length of the ropes and it’s very easy to do so. The Epitomie Fitness Sonic Boom Mach2 has a lifetime warranty and in addition to a carry case, you also get a box for gifting and/or storage. The Farabi skipping rope is budget-priced skipping rope and you need to set your expectations accordingly. 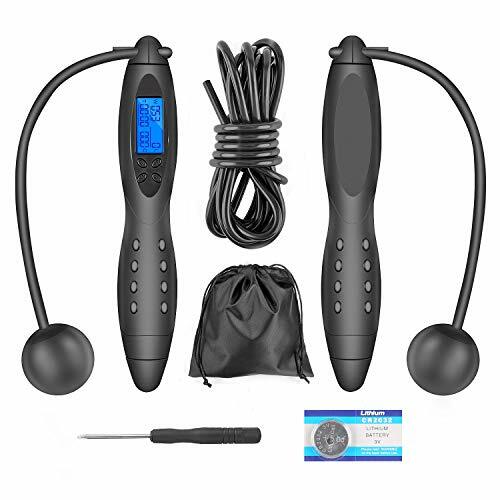 The reason it made it onto our list was because we felt it offered very good value for money and was hence a good choice for people who wanted to try out skipping before investing in a premium-quality skipping rope or people who only wanted a skipping rope to use occasionally. 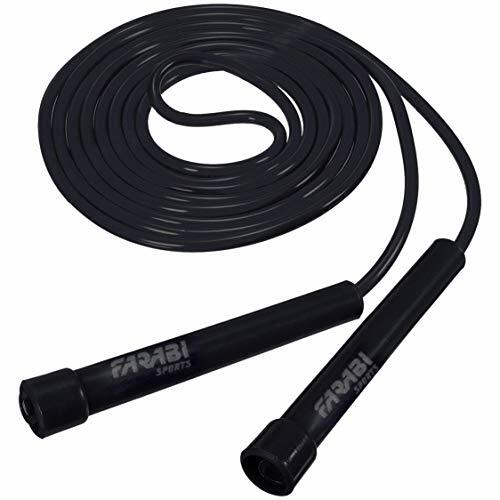 The Farabi skipping rope is about 2.5M long and is not adjustable although you can wrap the excess rope around your hands. The handles are comfortable and the speed is decent. The Gritin skipping rope is a nice, mid-priced option which could be a good choice for people who want to skip regularly, but who don’t necessarily want to train for boxing and/or CrossFit. The “rope” is PVC-coated steel and when it arrives it is 3.2M in length. This is adjustable and depending on the extent of the adjustment you may or may not wish to cut it. What we really like about the Gritin skipping rope is the fact that the handles are ergonomically-shaped and made of anti-slip memory foam for both security and comfort. The 360-degree ball bearings allow for smooth turning. Get Your Workout Anywhere: Compact,lightweight makes it easy to achieve maximum fat burn, tone your muscles and reach peak fitness anywhere. 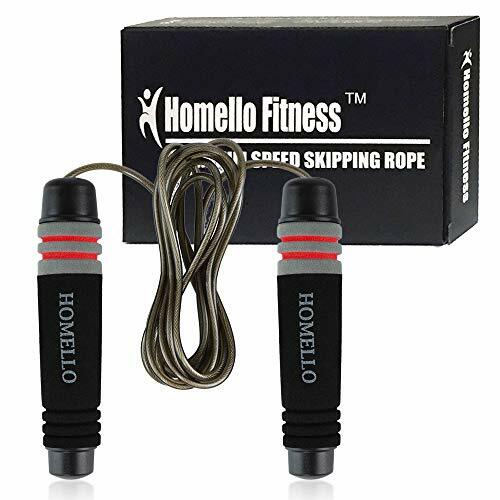 We’d class the Homello skipping rope as being the entry-level option for people who want to do proper boxing and/or CrossFit training. The “rope” is in point of fact wire cable, with a PVC coating. Out of the box, it’s 9.8 feet (about 3 metres) but there’s an easy adjustment mechanism to shorten it. The 360-degree ball bearings keep this skipping rope turning smoothly and the quality of the parts ensures that it can stand up to regular, serious use over the long term. The handles are designed to be comfortable and do a good job of absorbing sweat. If you’re looking for a decent skipping rope for a child or smaller adult and you enjoy the vintage vibe, then this skipping rope from Jaques of London could be for you. This is the only option which actually is a rope, as opposed to some kind of metal, but it does have a plastic covering and the wooden handles open to allow you to reduce the length from the original 7 feet (about 2M). Spin is not spectacular but it is decent. Obviously, it’s not for serious adult training, at least not long term, but it could be a fun option for light use or for children. NY-TECH ROPES FOR DURABILITY - Quality that lasts under the enthusiastic use. As the name suggests, this skipping rope was created with boxers in mind and the aesthetic reflects this. 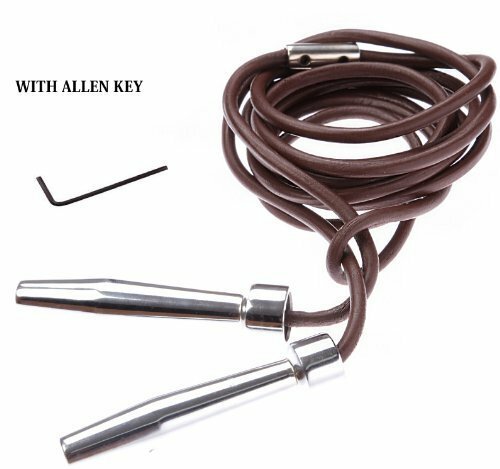 Instead of a rope, it has a brown leather cord, which is 11 feet (about 3 metres) out of the box. This is adjustable. 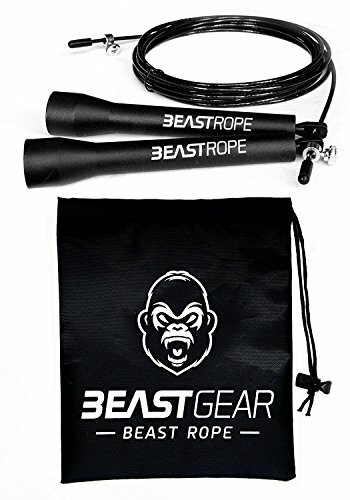 The handles are glossy steel, which not only looks good, but deliberately adds some extra weight, which means that this skipping rope may not be ideal for people who are just starting out in fitness, but could be a great choice for people who’re looking to challenge themselves, especially boxers and also CrossFit participants. This skipping rope by TOQIBO is really two ropes in one. The main rope is almost 3 metres in length (adjustable) and you also have the option to use a “short rope”, which is about 24 cm in length (on each side) with a weight at the end. The handles have good grip and the heads rotate on 360-degree rapid bearings to give you plenty of speed and flexibility. 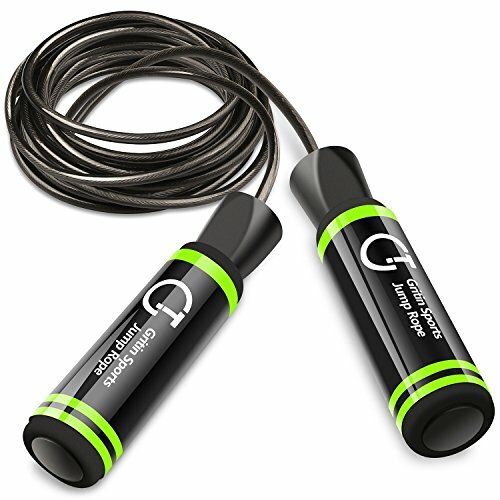 This skipping rope also comes equipped with a digital counter, which tracks time, calories and jump count. It requires 2 x CR2032 lithium batteries, which can be replaced. 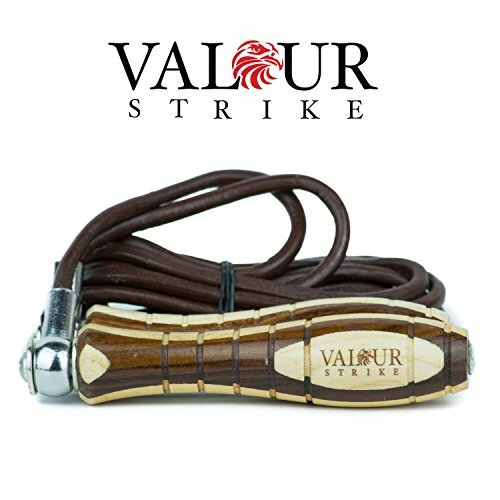 The Valour Strike premium skipping rope is another skipping rope aimed at boxers and so has a leather cord instead of a rope or steel wire. Out of the box this is about 2.8 metres in length. This can be adjusted. The exterior of the handles is made of rosewood with strategic shaping and grooving to provide both ergonomic comfort and drainage channels for your sweat. Inside, there is a polished steel rotation mechanism to ensure that the rope can spin as fast as you can. There is also weighting to increase the intensity of your workout. As always, there’s no “one-size-fits-all” answer to the question of what is the best skipping rope in the UK. Objectively speaking, the Epitomie Fitness Sonic Boom has the best specs but even people who would consider themselves really serious about fitness might conclude that they can’t justify its premium price tag. The Shihan and Valour offerings will definitely appeal to boxers and are also good options for people who really want to work their arms while doing their cardio. You could also use them for CrossFit although they might not be the best option. The Beast Rope and the Homello skipping rope are both great value for money with the Beast Rope offering great performance and the Homello being better suited to beginners. The TOQIBO is really the only choice for people who want to skip in really small spaces and still has plenty to offer people who want a solid skipping rope for old-fashioned cardio training. Our other mentions are all good, budget-friendly offerings which are suitable for general cardio especially if you only give them light use.